Irish Setters are known for their distinctive glossy coats which are long and flowing down their streamlined bodies. Irish Setters carry their fringed tails horizontally. Irish Setters originated in Ireland. Irish Setter males range from 26 to 28 inches (66 to 71cm). Irish Setter females from 24 to 26 inches (61 to 66cm). Irish Setter males range from 65 to 75 pounds (29 to 34kg). Irish Setter females range from 55 to 65 pounds (25 to 29kg). Irish Setters may be deep chestnut red or mahogany. Irish Setters are average shedders and require daily brushing in order to keep their coats in excellent condition. Lovable, energetic and sweet tempered, Irish Setters are excellent family dogs. Highly affectionate and intelligent, they are good with children. Irish Setters must be trained at an early age to prevent the development of bad habits. They are wonderful dogs and are considered a joy to own. 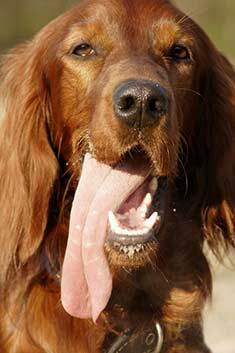 Irish Setters are susceptible to gastric torsion (bloat), epilepsy and Progressive Retinal Atrophy (PRA). Irish Setters can be expected to live about 11 to 15 years. Irish Setters require large yards and are best suited for country life. They love to run free in open spaces and have a high activity requirement. Irish Setters are in the Sporting Group. Gorgeous long flowing red hair: if it’s not a young Irish lass, it must be that most beautiful of dogs, the Irish Setter. Both Nixon and Truman lived with Irish Setters, and Cesar Milan’s very first dog was an Irish. What does the Irish Setter look like? The most distinctive feature of the Irish Setter is his long, silky, deep red coat. It almost looks like he belongs in a shampoo commercial. His hair is even feathered enough to give Farrah Fawcett a run for her money. This breed stands about 25 to 27 inches tall at the withers and weighs between 50 and 70 pounds. The long, thin ears are folded close to the head, while the gentle, expressive eyes are nearly almond-shaped. The nose may be black or chocolate, with wide nostrils. 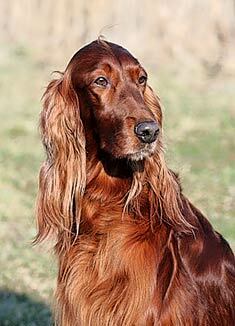 Irish Setters are very loving dogs with beautiful flowing red hair. Is the Irish Setter good with kids and other animals? Known as one of the most affectionate dog breeds, the Irish Setter gets along with everyone, including the guy who is trying to steal your new TV. He is definitely not guard dog material! The breed thrives on human companionship. If you leave him alone in your back yard, he is likely to jump the fence and go find a friend. In fact, part of the breed standard is that the dog be “demonstrably affectionate.” He simply thinks he is part of the family, and wants to assume his rightful place. Is this a smart breed? Absolutely! The Irish Setter is very intelligent and easy to train if given the proper positive motivation. However, they do like to pretend they are deaf, so you have to make sure the dog understands what’s in it for him when you attempt training. Harsh training methods will not be tolerated. This dog merely wants your love and attention, and a few treats would never be turned away. Using rewards of this nature will go a long way towards helping your dog learn basic obedience and any other tricks you wish to teach him. The biggest issue with Irish Setters is that they love to run. If you can’t provide proper exercise, this is not the breed for you. The dog needs a large open area in which he can work out some of his energy, but you must be certain he understands what “come” means before you turn him loose. He could be miles away from you before you even get back to the car to chase him. Due to his height, the Irish Setter is tough to contain in a standard four-foot fence. If you’re going to turn him out for his run in your yard, make sure your fence is high enough to contain him. Are there any health problems to which Irish Setters are prone? Although the Irish Setter is generally a healthy breed, there are some health problems that can occur in the breed. The life expectancy for an Irish Setter is 12 – 15 years. As with all large breeds, hip dysplasia may become a problem as your Irish Setter ages. Any dog who is to be used for breeding should be screened by X-ray to rule out hip dysplasia before breeding occurs. If you are looking for an Irish Setter puppy, ask the breeder to see certification from the Orthopedic Foundation of America on both of the parents before you put down a deposit on one of their puppies. Irish Setters are also prone to epilepsy. Although it is not known whether or not this is a genetic condition, prospective puppy purchasers should ask about the incidence of epilepsy in the breeding stock before committing to a puppy. If an Irish Setter does develop epilepsy, it can be treated with daily medication, continuing for the rest of the dog’s life. In some cases, special diets have been shown to reduce the frequency, duration, and severity of seizures. Gastric dilation-volvulus, sometimes called torsion or bloat, afflicts Irish Setters more often than many other breeds. Often, the only early symptom will be extreme restlessness, sometimes accompanied by a distended abdomen and dry heaves. All of these symptoms are the result of the stomach rotating inside the abdomen. This puts stress on the blood vessels around the stomach, and should be treated as a medical emergency. What was the Irish Setter originally used for? As early as 1570, dog books made mention of a setter, a dog which would track fowl “making no noise either with foote or with tongue…When he hath founde the byrde, he keepeth sure and fast silence, he stayeth his steppes and wil proceede no further, and weth a close, covert watching eye, layeth his belly to the grounde and so creepth forward like a worme…” This description probably referred more specifically to spaniels that were the ancestors of the modern-day Irish Setter. The description goes on to describe a dog that is mostly white, but has red markings. It is likely that setters were selectively bred to increase the amount of red in their coats until the younger dogs actually became a distinct, all red breed. By the late 18th century, the landed gentry in Ireland had begun breeding Irish Setters and keeping careful records which allow us to trace bloodlines back to at least 1793, when prominent Irish breeders included the de Freyne family, Lord Clancarty, Lord Dillon, and the Marquis of Waterford. Early Setters were red, red and white, lemon-colored, or white patched with deep chestnut. However, there was a preference for the solid red color, and it was bred selectively to the point where all Irish Setters are now solid red. The Irish Setter was brought to the United States in the early 1800s. Over-breeding in the middle of the 20th Century caused the breed to fall into disfavor as owners who were ill-equipped to handle such a magnificent dog were unable to properly train them. The breed was branded as both stupid and hyperactive, neither of which is a true characterization if the dog is patiently, positively, and properly trained. Today’s Setter, just as the one described in 1570, is an excellent hunter on both land and water. He uses his outstanding sense of smell to find a bird, then points to the direction where the bird is hidden. Is the Irish Setter the same as a Red Setter? Although they are basically the same dog, this question opens a real can of worms. 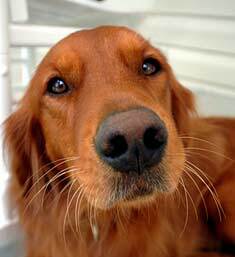 As noted above, the Irish Setter originally came in a variety of colors. However, there was a definite preference for solid red, and nearly all breeders selected for this color. From the late 1800s to the mid 1900s, Irish Setters became well known in conformation shows, but produced very few field champions. To revive the hunting skills of the breed, Ned LaGrange of Pennsylvania imported red and white field champion English Setters and began cross-breeding them with field champion Irish Setters, creating the Red Setter. Today, Red Setters are typically registered through the Field Dog Stud Book, while Irish Setters are registered through the American Kennel Club. In point of fact, most field champion dogs contain both blood lines, while most conformation show entrants are more likely not to have any Red Setter in their pedigrees. The Red Setter, because he is a working dog, generally is a bit smaller than the Irish Setter, tipping the scales at about 45 pounds. The coat is a bit less silky and the color tends towards russet or fawn, rather than the darker red of the Irish. The Red Setter may also have patches of white on his face and chest. Some Irish Setter breeders, particularly in California, have begun to selectively breed their Setters for field abilities, resulting in a few Dual Champion Irish Setters who have won both conformation and field trials. Is the Irish Setter the dog for me? If you are looking for an extremely affectionate family dog or a dog who can perform in both the show ring and in the field, this may be the dog for you. However, if you don’t have the time or desire to properly train him and if you don’t have a place for him to run, this is not a dog that will be a good fit for you. Find Irish Setter Puppies with our Free Breeder search!